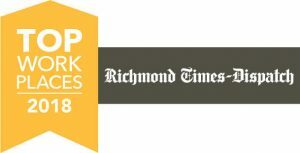 For the fifth consecutive year, UNOS has been named a Top Workplace program in the Richmond, Va. region. The announcement was made March 4 in the Richmond Times-Dispatch. UNOS is recognized as one of the top 20 among mid-sized companies (125 to 399 employees) based on employees’ responses to an annual survey. The ranking was based on the highest local scores and those scores that exceeded national benchmarks. The top winners in each of the four categories based on company size will be announced at the Top Workplace 2018 program May 3 at the Altria Theater and in a special section of The Times-Dispatch to be published May 5. The program is conducted by the Richmond Times-Dispatch and Energage, LLC.